Combine pumpkin and onion in a medium bowl. Spray with oil and toss to combine. 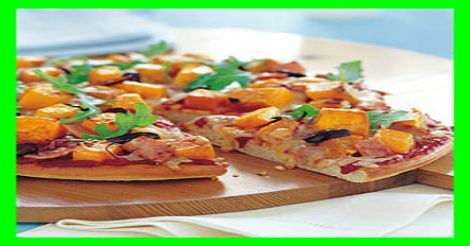 Bake vegetables in oven for about 20 minutes or until pumpkin is tender. Increase oven temperature to 220ºC. Place pizza base onto an oven tray and spread with salsa. Arrange pumpkin, onion and bacon over top. Sprinkle with cheese and olives. Bake in pre-heated oven for 15 minutes or until base is crisp and cheese is melted. Scatter with rocket and serve. This pizza is best eaten the day it is made. However if you have any leftovers, it can be stored in the fridge overnight, and reheated in the oven for 15-20 minutes.